autograph right off the card! 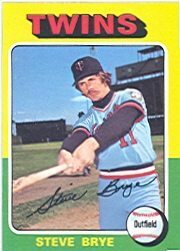 There’s still time to cheer for former Minnesota Twin Steve Brye. I tried. His all-star humility can outhit any compliment. Retirees are entitled to a bit of chest-thumping remembrances. Especially a platoon player. “I was great when I got to play. Could’ve been greater!” is the common response. Not Brye. This team player’s letter was a classy reminder of the 1970s players I admired most. Wow! There’s one possibility for Twins and Giants fans to ponder. “Now batting for the Giants, catcher Steve Brye”? “Yes, I went to Cuba to play ball, last Feb. and five years ago (Santiago and Havana). It was great. The people were great and I felt very safe there. Baseball is a terrific common denominator, and has provided chances for me that I would have never had, and to develop relationships that last a lifetime. Here’s a classic essay by Josh Wilker of “Cardboard Gods” about Brye. Coming Friday: Toast the post-season with Mike “TigerNut” Micho and his comprehensive autograph collection! I was at that 1974 (lolich) game when I was 6 days short of my 12th bday. You see Steve worked at the Ford Wixom plant driving cars from the end of the line to the trucks that hauled them to their destination. My Dad worked as a Trim Repairman at the plant and was a huge baseball fan as was I. Somehow my Dad (who was close to 50 at the time) and Steve struck up a friendship. My Dad had a lot of Steve’s stories to relate back to me about the major leagues. That summer we went to a game when the Twins came to town and Steve shook my hand before the game. He also had given me a signed autograph photo as well as a team ball (I still have both to this day). I was awestruck and could not say much. For the next part of the story you need to understand what a diehard Tiger and Mickey Lolich fan I was. Steve had a monster game that night (thought he had two home runs although retrosheet says only one). While running off the field after the game was over Steve made a point to wave to me (lower level box at Tiger stadium)and I did not wave back because I was so mad at him for beating Mickey and my beloved Tigers. By the way the Tigers were awful in 74. I still regret that to this day. Steve Brye is a great guy and I wish his career would have been longer. My Dad and I followed him until he left the sport. I hope all is well with him. Best wishes Steve from the son of Big Joe.